Adur and Worthing police said goodbye to a long-serving officer today. 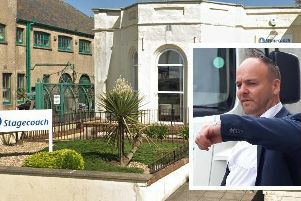 Sergeant Ian Cooke arrived at Worthing Police Station in Chatsworth Road in style in a 1967 Jaguar Mark Two to call time on his 30-year career. In a tweet, Adur and Worthing Police thanked Sergeant Cooke for his commitment and service and wished him all the best for the future. “Stand down and take it easy,” they said.